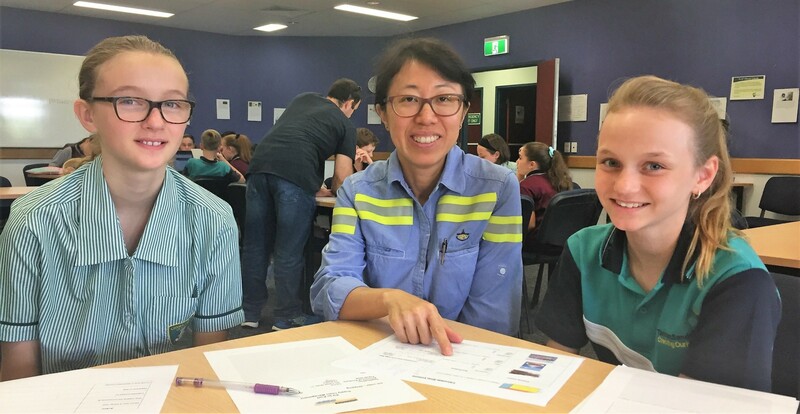 QMEA’s Pit to Port workshop provides year 7 students with an understanding of the processes and challenges of moving resources across Queensland, to ports and onto customers here and around the world. Workplace health and safety: Students hear from industry professionals who give insigths to the wide scope of WPH&S and why it is so vital in all aspects of work and home life. Throughout the day students are asked to provide ‘safety shares’ to the group and include examples of hazards and risks during their end of day presentations. Fleet management: Students are provided with a small fleet of dump trucks all with different speciations (running costs, tonnage capacity, circuit run time). Students are then given ‘job orders’ to fill stockpiles. Students must assess all specifications to determine the best fleet make up for their shift. Students graph stockpile amounts as well as complete a ‘shift hand over’ document, which outlines various processes, including maintenance issues. Supply chain management: Students assess the volume-carrying capacity of shipping tankers and convert this into mega litres. Orders for ‘product’ are issued stating export country, departure tide times, tug numbers and carrying capacity. Students assess various resources to work through the supply chain, link by link. Presentation to board: The day culminates in the students providing a PowerPoint presentation to the board showing the outcomes for each of their challenges. Students take questions from the board members to support the decision they made while on shift. The day is well supported by industry members currently working in this space.